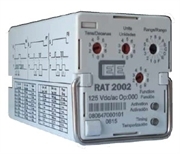 Panel-mounting auxiliary relay used in sequential control schemes requiring either a time-delay on pick-up /energisation, or a time-delay on drop-off /de-energisation. Contact ratings are sufficiently high to allow these relays to be installed in trip circuits. • RAT3044: 4 change-over time delayed and 4 instantaneous contacts . Each model can be specified with AC or DC coils in various voltages. Timer ranges are adjustable between 30ms and 99hours. These relays are supplied with a panel-mounting socket. See the Auxiliary Relay page for a full brochure.